"Trump is a builder. 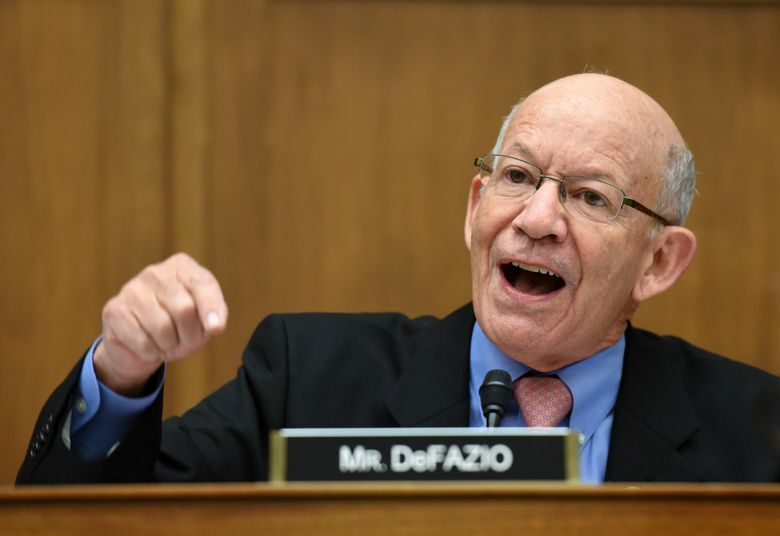 He gets it" about the nation's need to invest in infrastructure, says U.S. Rep. Peter DeFazio, D-Oregon, who's in line to become the new chairman of the House Transportation Committee in January. WASHINGTON – The likely new chairman of the House Transportation Committee hears renewed talk from the White House about investment in infrastructure and he jokes about Lucy always pulling away the football just as Charlie Brown is about to kick it. President Donald Trump, as a candidate in 2016, made investing in the nation’s crumbling infrastructure a key part of his campaign. After winning the White House, DeFazio said, Trump came under the influence of advisers who told him big projects could be funded by selling off infrastructure to private firms and attracting private capital. Those advisers no longer work in the administration. In the aftermath of Tuesday’s midterm elections where Democrats won control of the House, DeFazio was asked whether he thought Trump was sincere about pumping money into infrastructure. The push to invest billions – DeFazio suggested $500 billion – in infrastructure comes less than a year after a Republican Congress passed a sweeping tax cut that is projected to add more than $1 trillion to the deficit over 10 years. DeFazio said the White House “had a finger in the wind” and dispatched an emissary to meet with him before Tuesday’s election. “I would hope that we could have [an infrastructure] package through the House in six months, before we get into the silliness of the presidential election year,” DeFazio said. After 31 years in Congress, DeFazio said he knows “there’s myriad ways” to come up with transportation funding. “That won’t be what we’re going to do this year, but that may well come into play in the reauthorization in 2020,” he said. DeFazio said the process of reaching a consensus would be helped by the absence of House Speaker Paul Ryan. The Wisconsin Republican did not seek re-election. DeFazio said the Transporation Committee would increase scrutiny of Trump’s Department of Transportation, an agency headed by Secretary Elaine Chao, a matter complicated on Capitol Hill because she is the wife of Senate Majority Leader Mitch McConnell, R-Ky.
“There is bipartisan concern on the Hill that DOT is slow-walking all of the transit grants, not expending funds that were approved by a Republican Congress for transit,” DeFazio said. Earmarks fell from favor, in part, as a result of the infamous “bridge to nowhere,” a $398 million project tucked into a federal transportation bill by two Alaska Republicans, Sen. Ted Stevens and Rep. Don Young. The bridge in Ketchikan, which would have served a small airport and about 50 residents, was never built.